A seamless gutter is the most popular style of guttering on residential homes. The term, “seamless,” can often be confusing to homeowners because, in fact, there are seams in the gutters. However, the seams are only at the ends of the gutter or where a downspout is located. The seamless gutter itself is a continuous piece of metal (most commonly, aluminum or copper), that not only is durable, but aesthetically pleasing. By using one, continuous piece of metal, it reduces the possibility of leaks. Additionally, the baked-on enamel finish (aluminum gutters) never requires painting and protects your home and landscaping. What Metals can be used for gutters? Aluminum and copper are the most common types of metals that gutters are made from. 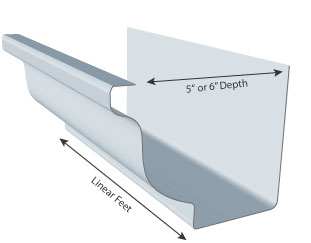 There are a variety of color options available to you when choosing aluminum gutters. Above is a picture of what the typical gutter looks like. This is called a “K” style gutter. For more information about seamless gutters, give our roofing contractors in Naperville a call today!